Thank you for submitting the Contest Entry form! Complete the next two steps to complete your entry. EMAIL US YOUR SCRIPT. Submit in any of the following formats: Adobe Acrobat PDF (preferred); Rich Text or Microsoft Word documents; Final Draft format or Movie Magic format. the transaction, but you will go to PayPal to enter your payment information. If you have a discount code, you can enter it in the shopping cart process. 2-3 pages of notes, tips and strategies for improvement. 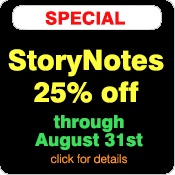 A "light" version of our StoryNotes service (a $100 value), feedback helps you find and fix what may be holding your script back.